You know what? I have no idea how I found this brand. But I did. I am pretty sure another Facebook fanpage that I follow posted a sale with free shipping on Delusional's etsy site. There's something about free shipping that really gets me!! Is anyone else like this? 20% is cool, buy 3 get 1 free is okay, but there is something about "sale w/FREE SHIPPING" that I like. That's how I got hooked on Teavana tea!! Anyway, I picked out this fabulous peachy shade, Coral Beach, right after I got home from a trip to Connecticut, my other home, which is right on the beach. Right On De Beach, Boooooy! LOL. Carrying on! 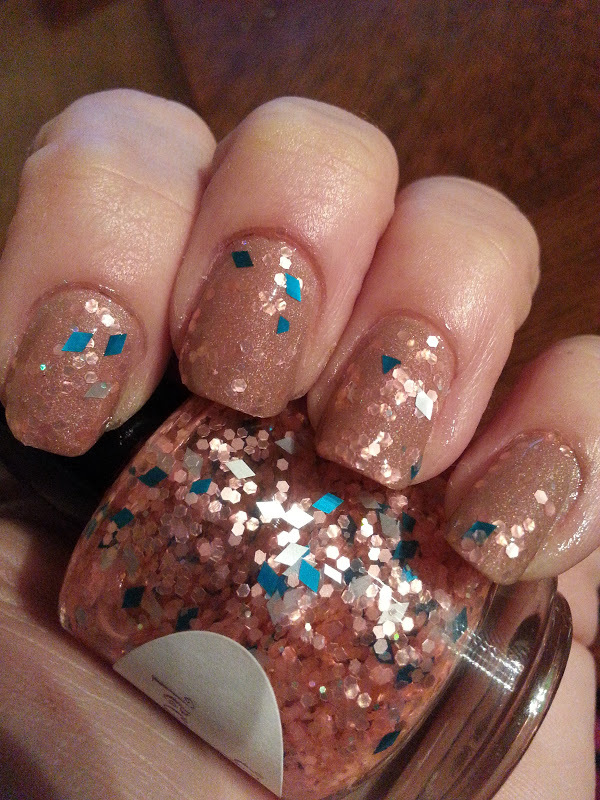 Coral Beach is described as: "This polish has peach and silver medium hex along with blue and baby blue diamond glitter." Yes, sure does! The formula is near perfect, and my looks show 2 coats over various base coats and under a single coat of Butter London Matte. There is zero fishing required to get a full coat of glitter. Love the turquoise hints among the peachy-beachy sand stone colored glitters. Oh! And the packaging is super cute and shipping was ridiculously fast. I appreciate that very much! Instant gratification, baby. 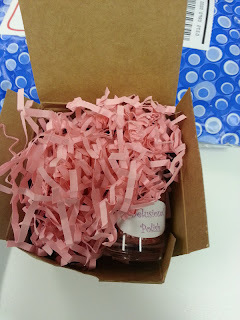 Confession: I looove pretty packaging! Bring on the ribbons, bows, tags, tassels, confetti, and whatever else you have! This came in a little box with coordinating pink paper confetti. Cute! 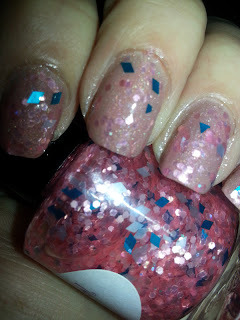 This is 2 coats of Delusional Polish over Maybelline Iced Queen (also a good formula!) NO topcoat above. Those are Coral Beach over Butter London All Hail The Queen with a coat of Seche. Love the beachy like look. I found something similar when I was googling pics from the shop and wanted to duplicate it. 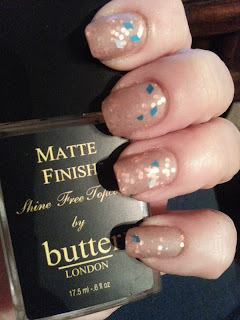 And I had to check it out with a matte topcoat, too! 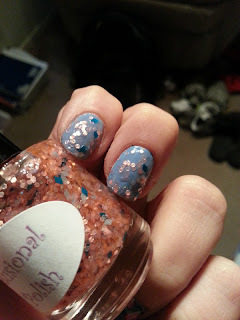 ButterLondon is awesome so one coat totally changed the look of Coral Beach to a post-stormy, subdued beach look. Nice! The pops of turquoise really make this unique. 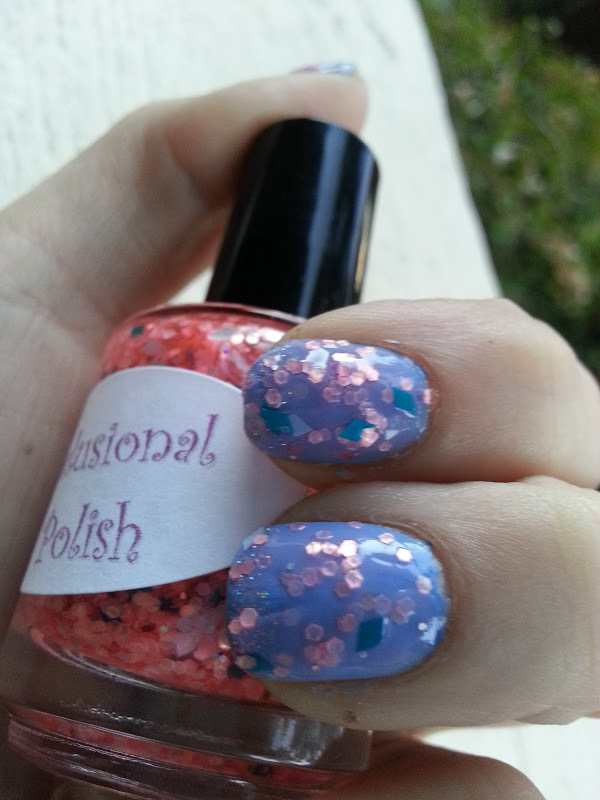 You can find Delusional Polish on etsy: HERE and on Facebook: HERE! 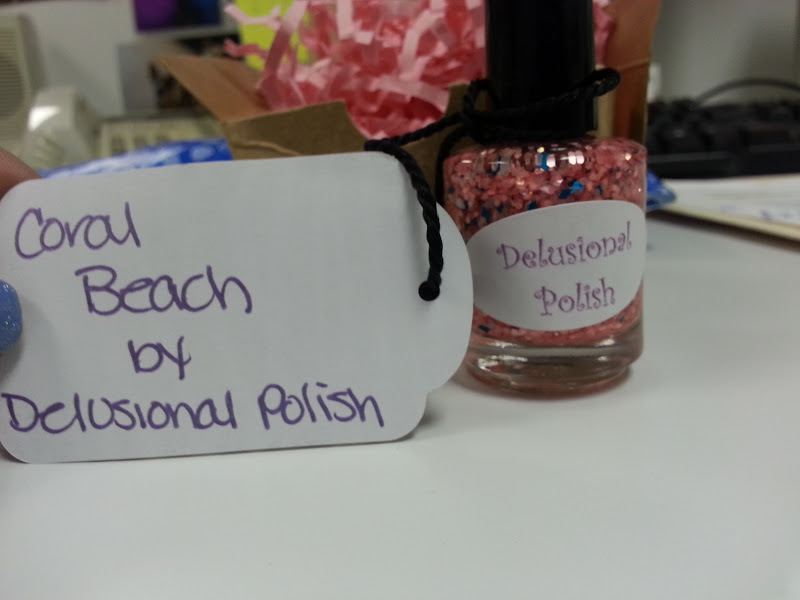 What do you think of Delusional Polish? ?